← 496 "Politically Inept, with Homer Simpson"
Winter at Squidport. Dead seals wash up daily. A large demon flies by carrying a struggling Ned Flanders. "The D'oh-cial Network" is the eleventh episode of Season 23. 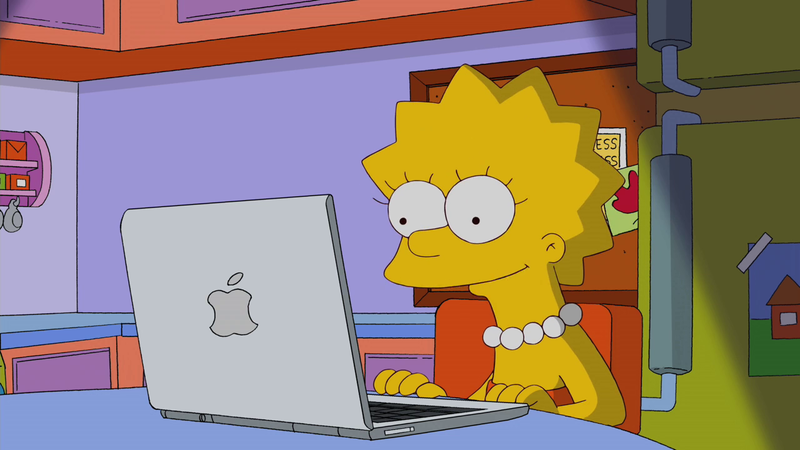 "As the mastermind and creator of the online social networking phenomenon SpringFace, Lisa is called to trial when Springfield's obsession with the site becomes chaotic and dysfunctional. Lisa recounts her story and explains that she created the site after realizing she had no real friends. But as SpringFace expands and Springfield's fixation with the site causes mass hysteria, Lisa begins to realize that adding thousands of friends online did not compare to having real friendships. 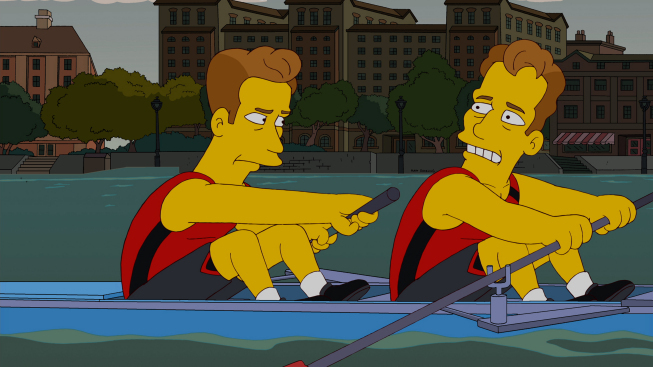 Later, Patty and Selma compete against the Winklevoss Twins in the rowing event at the 2012 Olympic Games." In Springfield County Court House, Lisa is getting tried for creating a social networking site, SpringFace, which has caused devastation in town. Lisa begins to explain her story. Two months prior, the family went to Towne Centre at Springfielde Glenne. Here, they met Lenny who had bought a condo here. After telling him that he can't go shopping with them, he runs off into American Princess. Marge gives the rest of the family coupons to use in the shops and they all go their separate ways. Lisa explains every shop that they went to and the Blue-haired lawyer, back in normal time, tells Lisa to hurry up and get to it. Lisa says that she has cut a lot of it out and all the curse words have been cut out too. Back to two months ago, Lisa meets Sherri and Terri outside Home of the Braid where they tell her that she is unpopular. Meanwhile, Homer buys a Mapple Void from the Mapple Store. Upset by the fact she is unpopular, Lisa comes back home from school one day and Homer invites her to become friends with his new computer. Lisa discovers it's so much easier to make friends with people over the Internet than in real life and decides to set up a social networking website, SpringFace. Enlisting the help of fellow nerds Martin, Database, Cosine and Report Card, they get the idea of the layout from Nelson who then attacks the nerds and walks out again. Eventually, SpringFace becomes popular, not only between the children, but the adults start to use it as well. Lisa realizes that she has made something immensely popular. Pretty much the whole of Springfield starts to use it, using mobile devices to go on it even when driving. Eventually, Lisa realizes what has happened, she feels more alone than ever before as everyone is using SpringFace and not speaking to her in real life. Back in court, the blue-haired lawyer explains that SpringFace had become a failure to Lisa and was the biggest failure since Ask Jeeves. Jeeves then gets up and walks off, head hung low. Eventually, devastation starts to happen in Springfield. There are lots of car crashes due to people being on SpringFace and 35 people end up dead. Back in the court room, Lisa is asked to shut down SpringFace, which she does. Everyone starts to get on with their normal lives. Principal Skinner was convicted of selling hornet honey as bee honey. Mr. Burns received a payment of $35 million even though he didn't do anything. Lisa learned that it's not how many SpringFace friends you have, what matters is how many followers you have on SpringTwit. Kearney's avatar died in Vietnam. 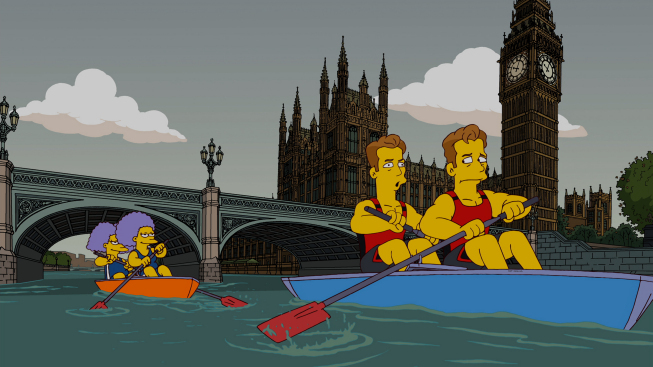 In London, Patty and Selma are taking part in the London 2012 Olympics rowing event, against Cameron and Tyler Winklevoss. Patty and Selma pull ahead and the Winklevoss twins then start to make out with each other. As the credits start to roll, a story about Bart and Milhouse starts to play. Bart, bored in school one day, decides to cover the school in toilet paper. He and Milhouse bulk buy a lot of toilet paper from the 98c Store and then cover it, only for a large eagle to claim the toilet papered school as it's nest. It takes Bart and Milhouse and feeds them worms. To this day, they are still there. Principal Skinner finishes reading the book and says that's why you shouldn't pull pranks. His chair then breaks and everyone laughs. Armie Hammer guest stars as Tyler and Cameron Winklevoss, David Letterman as himself and the The Tiger Lillies were credited with a special music guest. 21 cues were spotted for this episode for a total of about six-and-a-half minutes of music. 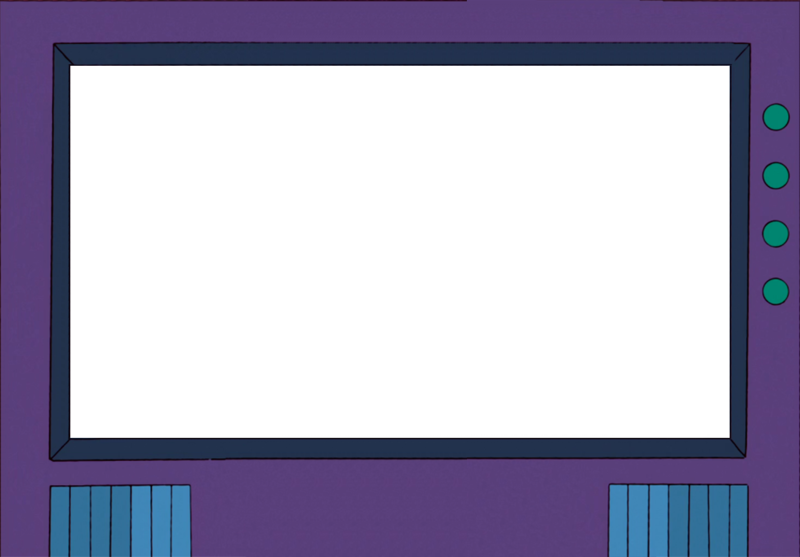 There was an extended couch gag, which guest starred David Letterman. 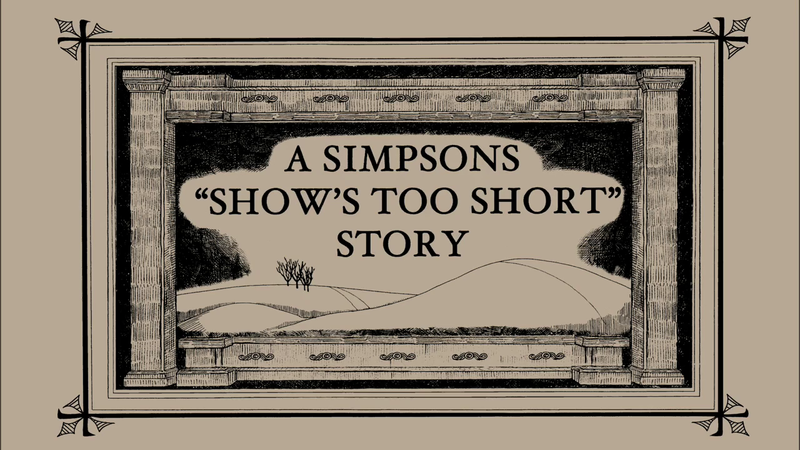 The episode was short so A Simpsons "Show's Too Short" Story was aired at the end of the episode, with similar animation style and music to the Dark Stanley story from "Yokel Chords", both homages to American illustrator Edward Gorey. Tiger Lillies performed the closing credits. This episode gathered 15.703 million viewers on its premiere in the US. Modified on July 16, 2017, at 03:38.